& some topics that I’d like to cover on this blog. 1) Love is number one – hence the heart and the word “love” on the small tin cover that I’ve had for many years that my husband gave me. 2) I love beautiful and colorful fabrics, trims, tassels – so they would naturally play a role in this mood board. 3) Nature is a big part of my life, so I included the seed packet, sand dollar, coral fan (you can see a little bit of it in the right side of the board), the dried lavender and hydrangea. 4) I adore Paris – and just about anything French. 5) I love a little “bling” in my life – hence the glitter on the heart and the Fleur de Lis. Oh…that’s bling and French! 6) I made those little ornaments – so my love of craft is represented also. 7) Texture plays a big role in my life – the backdrop of the right side of the board is a multi-layered texture that I created with a metallic plaster. 8) I love to paint and antique furniture, so images of these needed to be here. You can also see my love of texture in the antiqued furniture on the right side – plus the antiqued blue cabinet face has great texture and color to it. 9) The colored pencils are there to remind me to sketch more often because it relaxes me and it helps me to be more creative. They also represent my love of color. 10) Finally, the paint swatches are two of my favorite colors – green and blue. I know that I could have kept (and soon will be!) adding to this…but keeping it simple helps me to zero in on the things that are most important to me that I want to cover in this blog. Use Mood Boards to Help Your Put a Room Together. 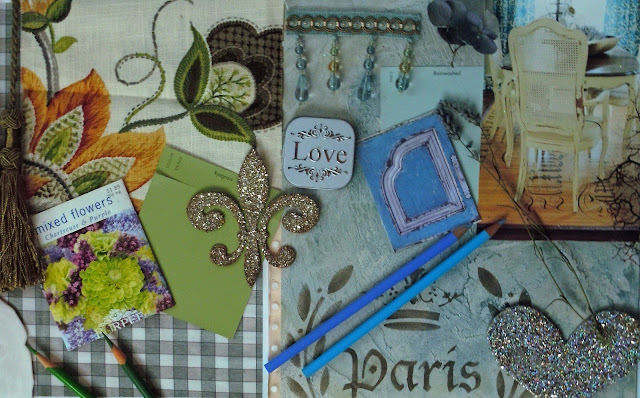 Creating a mood board is a great exercise to do also when you are creating a design plan for a room. On a board (or in this case – on a file folder) you can gather your fabrics, wall and trim color, carpet swatch, wood swatch – plus furniture and accessories that you would like to have in the room. When placed in close proximity – you can tell right away if your colors blend and you can gain a better sense of what the “feel” of your room will be. Try this at home. I think you’ll have a lot of fun and I know you will learn something about yourself also. You may just come up with something wonderful that will evolve into a room design that will be more “you.” Feel free to email me some of your mood boards – would love to see them! I did my mood board by hand (as I suggest you do), but you can also try an online mood board by visiting Olioboard and also Pinterest – which are online collections of mood boards and images that members collect and share. On a slightly different note, there’s also a great site called Wishpot that’s a great tool that will help you organize items that you’d like to buy online. So, if you’re re-doing a room you can collect items from all over the web and keep them in this repository for future use. It’s also a great tool to use if you’re doing your Christmas shopping or anytime you’re shopping for gifts. It will keep you organized (as in you’ll be able to find the links to items you’ve saved) & inspired. I am thinking of making Mood Boards a regular feature of this blog. What do you think? This entry was posted in Annie Sloan's chalk paint, Benjamin Moore, interior design and tagged color ideas, design ideas, interior decorating, mood boards, room ideas. Bookmark the permalink. Great Mood Board! Also, could add some jewelry -if the design is appropriate – to further emphasize the theme. Sunflower could be added for Paris/French theme. Thanks – yes, I forgot about a beautiful Fleur de lis diamond charm that my husband bought me last year (should have added that!). Sunflowers – yes, they are my favorite. Will include that next time.